Can I set up my own Amazon Server… Yes I Can!!! My first thought on doing this project was: How hard can it be? When I sat down and read the directions on EC2 For Poets, I thought that it sounded easy enough. Oh how I was mistaken. When I first opened up Amazon AWS it requested that I put in a credit card just in case I included anything that wasn’t in the free version. How do I know if it’s in the free version or not?!? I just went along since other people had to do the same and so far, I have yet to be charged for anything. I hope that continues. When I navigated my way to the home page I noticed that things were different than what was being described to me on the tutorial. It was at this moment that I could tell that we were doing this on different versions. Now, I was on an adventure. 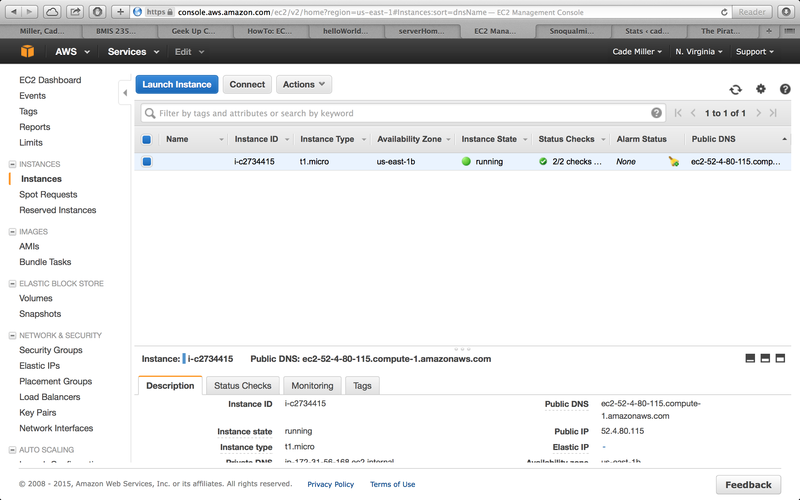 The like to my server is ec2-52-4-80-115.compute-1.amazonaws.com. I have a very big sense of accomplishment after completing this project because I saw it go from nothing to something in a matter of hours. It was such a sense of pride and confidence to know that I can do this stuff, all I have to do is put my mind to it. I will have to say that this is probably one of the coolest things that I have done on my computer to date. I look forward to exploring what else the vast internet has to offer me.